Sweet, savory, decadent – this elegant dish courtesy of Dan Lorig of Honeydrop Beverages is rich in antioxidants and big on taste! 1. Carefully, core pears from the bottom, then peal and reserve in cold water with a few drops of lemon juice to prevent browning. 2. Combine the Wine, Honey (reserve ¼ cup), Lemon Juice and spices. 3. Place pears and honey mixture in a 2 -3 quart saucepot ensuring that the poaching liquid fully covers the pears. 4. Place a small oven safe dish on top of the pears to keep them submerged throughout the cooking process. 5. Poach the pears on medium heat and bring to a slow simmer. 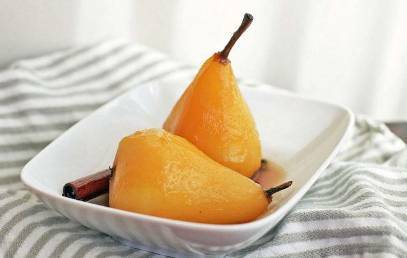 Continue poaching the pears for approximately 40 minutes or until they are fork tender. 6. Remove the pears from the honey liquid and refrigerate to cool (Discard the star anise and cinnamon stick. 7. Reduce the remaining liquid down to 1 cup. 8. Remove the reduction from the heat and add the remaining honey. Refrigerate to cool. 1. Place a chilled pear on a small chilled plate (trimming the bottom as necessary, for a flat surface). 2. Drizzle the chilled reduced poaching liquid on top of the pear and place the Gorgonzola and Hazelnuts around the plate to garnish.